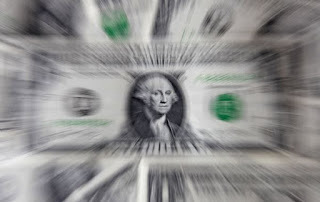 Anticipation of a sharp downward revision in Q1 US GDP has seen the dollar's gains trimmed a bit, though it has gained against all the major currencies this week. Rather than expand in the first three months of the year, the world's largest economy likely contracted. The debate is over how much it contracted its significance. The 0.2% growth estimated is expected to be revised down to -0.8%-1.0%, due largely to a larger trade deficit and smaller inventory accumulation. Fed officials and many economists argue that the headwinds are transitory, and indeed, data for Q2 is already shows the economy is growing again, even if not as robustly as seen in Q2 14, when the economy recovered from a contraction in Q1 also. Also much has been made of seasonal adjustment issues. The Bureau of Economic Analysis has indicated it will incorporate new seasonal adjustments with the Q2 GDP release at the end of July. This is spurred a cynical response by many, but the point to bear in mind is that seasonal adjustment will change how the growth is distributed among the quarters, but won't lift real growth itself. The significance of a contraction in US GDP is two-fold. On one hand, it will necessitate a change in the Fed's forecast for 2015 GDP. The middle of its central tendency is 2.5% based on the March forecasts. The risk is this is cut to 2% at next month's meeting. Some accuse the Fed of consistently being too optimistic on GDP, but a closer look indicates that the Fed has underestimated the pace at which unemployment has fallen. This suggests that the Fed officials have not fully taken on board the slowdown in productivity. The deeper the downward revisions to Q1 GDP, the worse productivity will be when reported next week. It has been estimated at -1.9% and this could be revised down toward -2.7%-2.9%. On the other hand, a contraction in Q1 GDP, especially if understood to be due to transitory factors, is unlikely to prevent the Fed from hiking rates later this year. The Fed's leadership has said as much. Surveys suggest more than 70% expect a hike in September--pushed out from June previously. Next week's employment data is seen as more critical for such views than today's revisions to Q1 GDP. 1. Eurozone money supply growth is accelerating. M3 rose 5.3% in April, faster than the 4.9% expected, and the 4.6% pace seen in March. Credit extension grew 0.8% year-over-year. Lending to households increased by 1.3% after a 1.1% pace in March. Lending to non-financial businesses continued to contract, but at a slower pace. The 0.1% contraction follows a 0.2% fall in March. Some had expected it to turn positive as it is the last data point for the next tranche of TLTRO funding available in mid-June. 2. Japan reported several pieces of macro-economic data. The take away is that while industrial output is expanding (1.0% in April) after contracting in March and unemployment fell (3.3% from 3.4%), consumption remains weak. Overall household spending fell 1.3% year-over-year. The consensus called for a 3% increase. It has not been positive since March 2014, prior to the sales tax increase. Meanwhile, core inflation, which in Japan excludes fresh food, rose 0.3% year-over-year, which was slightly better than the 0.2% expected, but the Tokyo May core reading slipped to 0.2% from 0.4%. The poor inflation (0.4% excluding food and energy) underpins market expectations that the BOJ will provide more stimulus later this year, even though it has pushed out when it will achieve its 2% target. 3. Sterling continues to under-perform. It has not managed to move off its lows as has the euro and yen. The post-election euphoria is waning as Cameron's call for re-opening the Lisbon Treaty is not winning much support among other EU countries. At the same time, there increasing talk that the UK economic cycle has peaked. Next week's PMI data is anticipated to lend credence to such arguments. With this week's losses, sterling has retraced nearly the post-election rally. 4. The Swiss economy contracted for the first time in 4.5 years. The 0.2% contraction follows a 0.5% expansion in Q4. The surge in the Swiss franc following the lifting of the cap took a toll on exports, which fell 2.3%. The SNB expects the economy to expand by a little less than 1% this year, but this will likely be revised when the SNB meetings in mid-June. The IMF forecast is for 0.75% growth this year. 5. Spain reported that its flash CPI for May improved to -0.3% from -0.7% in April. This was a larger improvement than the market expected. However, the focus remains on the fallout from last weekend's local and regional elections. Spanish assets have under-performed Italian assets this week (and Italy has local and regional elections this weekend). The Spanish benchmark 10-year bond yield has risen 6 bp this week compared with less than one in Italy. The Spanish stock market has slipped 2.3% this week compared to less than 0.5% in Italy. 6. Norway's economic data may ease some calls for a Norges Bank rat cut. Retail sales rose 2% in April and unemployment fell to 2.7% in May from 2.9% in April (revised from 3.0%). On the other hand, the Swedish economy expanded a disappointing 0.4% in Q1. The consensus had expected a 0.6% expansion. With deflationary forces, the Riksbank may still expand its bond buying program. 7. The US dollar reached new multi-year highs against the yen yesterday, and today it is rose to new 4-year highs against the New Zealand dollar. A 1.7% fall in April building permits, coupled with this week's poor dairy developments, has heightened calls for an RBNZ rate cut. It meets next on June 10. 8. Canada reports Q1 GDP at the same time as the US today. Canada appears to have escaped a contraction, but growth was likely anemic. The consensus expects a 0.3% expansion at an annualized pace. The Bank of Canada continues to expect the economy to recover in Q2.